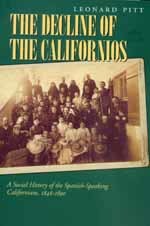 In his enduring study of Spanish-speaking Californians—a group that includes both native-born Californians, or Californios, and immigrants from Mexico—Leonard Pitt charts one of the earliest chapters in the state's ethnic history, and, in the process, he sheds light on debates and tensions that continue to this day. In a new foreword for this edition, Ramón A. Gutiérrez discusses the shaping and reception of the book and also views this classic work in light of recent scholarship on California and ethnic history. Leonard Pitt is Professor Emeritus of History at California State University, Northridge. He is the coauthor, with Dale Pitt, of Los Angeles A to Z: An Encyclopedia (1997). Ramón A. Gutiérrez is Associate Chancellor and Professor of Ethnic Studies and History at the University of California, San Diego, and is coeditor of Contested Eden: California before the Gold Rush (California, 1998).